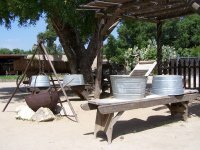 On wash day, soup beans were usually fixed for supper since the beans could be put in a pot on the stove or over a fire and left to cook all day. Laundry at the Adobe was a laborious process. Dirty clothes were sorted soaked and rinsed. 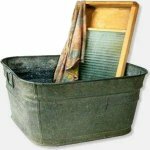 Clothes were put in to a tub and rubbed 2 times on the wash board, then boiled in the iron kettle with lye soap which had been shaved for this use. Laundry was then removed with a wooden stick and put into the rinse water. After rinsing the laundry was put through the wringer. Clothes were hung on a clothes line to dry and sanitize. And, yes, in the winter, clothes would freeze dry. They were then taken down starched, sprinkled with water and folded to prepare for ironing. Flat irons, which were heated on the stove, were used to remove the wrinkles in the clothes. Some irons could be filled with hot coals. The laundry water was emptied over the plants. Soapy water was used to scrub porches. The tubs were then turned upside down to dry and be ready for the next use.